Last week Jeff Nekola (Univ. of New Mexico, Albuquerque) gave a seminar at NCB Naturalis, entitled “The ten things every macroecologist should know about land snail biodiversity”. Although based on an extensive survey of more than 1500 North American sites, representing more than 400 taxa (mainly microsnails) and over a half million specimens, the main points of his talk may be inspirational to Neotropical malacologists too. More than half of the taxa and over 80% of the individuals found in his survey belonged to these truly ‘micro-snails’. Comparative data about Neotropical faunas are largely unknown, but my guess is that the trend could be the same. This would imply that much taxonomic work still needs to be done focussing on micro-snails. The majority of taxa had a clear preference for either a ‘duff’ or a ‘turf’ habitat. In the former the grass roots layer is limiting the distribution of snails, in the turf habitat the moisture plays an important role. In the Neotropics, the macro-snails are only partially soil-based (e.g. Bulimulus) and arboreal species may be regulated by other factors than soil moisture. More than half of the North American species has been observed in at least one acidic site. Thus, contrary to intuitive ideas, snails may also be encountered in acidic habitats. They are usually under-sampled and may appear rare. A nice example of this phenomenon are the snails from Venezuelan tepuis. It is likely that under such conditions snails use plants as their main calcium source. Even a small quadrat usually holds a significant percentage of the total land snail richness. A consequence of high levels of microsympatry is that land snails often have exceedingly high intercept and low slopes to their Species Area Curves. A notion during the discussion was that snail occurrence can be very patchy, one you have found the spots where they flourish you may easily find them. 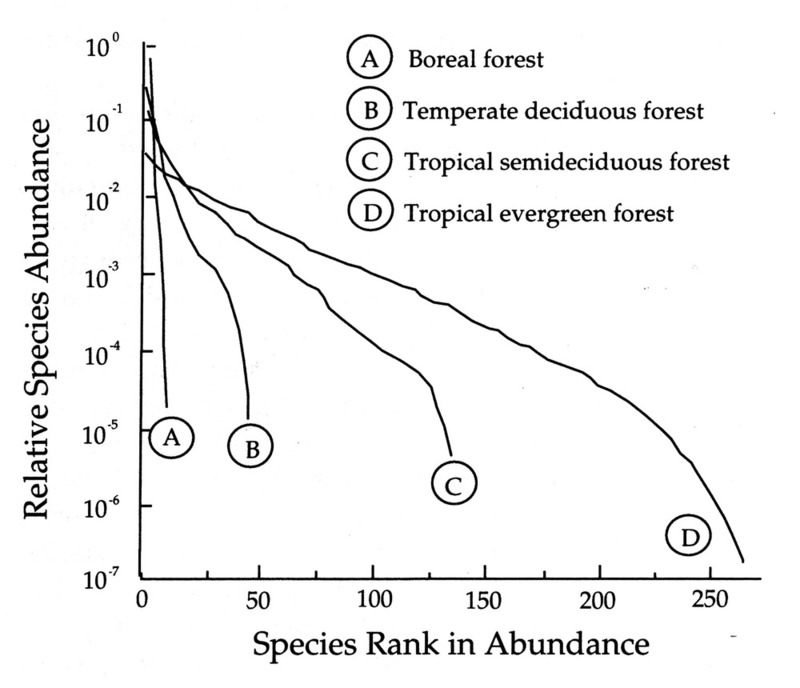 This organizing principle can be illustrated with dominance-diversity curves from closed-canopy forests. Regional species richness varies with latitude and may be deconstructed into four categories: Alpha (within site), Beta (additional species found only in different habitat), Gamma (additional species found only in other examples of the same habitat), Beta/Gamma (additional species found only in both the same and different habitat types in region). Alpha increases with latitude, Beta decreases, and the geographic turnover (Gamma + Beta/Gamma) again increases with latitude. My gut feeling says it is roughly the same for Neotropics, but this is clearly a topic for any interested ecologist. Large species increase in abundance towards the equator. Of the areas investigated North America show a decrease of smallest species towards the pole, while these increase in Europe and New Zealand. In the Neotropics small shelled species probably also become more abundant towards the pole, as relatively larger species drop off. The most likely explanation is that small snails are much more likely to uniparentally reproduce and to be passively dispersed by birds, mammals, and wind, compared to larger species. At regional scales and above, more large species and fewer small species exist than is expected from the number of individuals alone. The decoupling of richness and abundance across the body size spectrum becomes more pronounced with decreasing latitude. Phylogenetic research of Vertiginidae lead to the insight that phylogenies are not geographically segregated; Eurasian species are no more divergent from North American species than North American species are from each other. Species-level branch-lengths appear to be inversely correlated with latitude. An analysis of diversification rates showed an remarkable increase around 7 myBP, which may be correlated with a global shift from C3 to C4 grasses. This was a very insightful seminar and inspirational at the same time. This entry was posted in Uncategorized and tagged ecology on July 22, 2011 by bramb.